Sport for Jove’s outdoor season is always something to look forward to during the Sydney summer (weather permitting) and this year’s production of Love’s Labour’s Lost is a delight. I saw the play at Bella Vista Farm Park in the Hills Shire and have been tardy in reviewing it so that season is now over. However, you can catch the production at Everglades Gardens in Leura during January – and it’s well worth it. At Bella Vista Farm, Sport for Jove has a new purpose-built stage. With a lighting rig and backstage area, it is better equipped for the cast and crew. Constructed at the bottom of a gently sloping hill, it also provides better sightlines for the audience who can either sit on a picnic blanket, or a little further up the hill on provided plastic chairs. The set-up may not have quite the same charm as when the company performed in a courtyard in front of the farmhouse or in the nearby shed, but it is eminently practical. What’s more, the set (co-designed by Damien Ryan and Anna Gardiner) is vibrantly attractive in a shabby chic kind of way with wisteria-draped screens and walls and a “marble” floor: a staging that sits well and looks good in the outdoor setting under Sian James-Holland’s lighting. Love’s Labour’s Lost is one of Shakespeare’s early, rarely performed comedies. It’s a wordy piece though it never feels cumbersomely so here. In his program notes, director Damien Ryan writes that he has removed the play’s “most impenetrable material” but admits that some of the language remains “a curiously knotted garden”. However, there’s lots of wonderful poetry and the production rollicks along with such an infectious energy that any difficult language never becomes an issue. The plot is light and rather silly. The young King Ferdinand of Navarre (Edmund Lembke-Hogan) and his friends Lord Biron (Tim Walter), Dumain (Curtis Fernandez) and Longaville (Gabrielle Scawthorn) take a pledge to avoid woman and wine for three years and instead devote themselves to study. But before the ink is dry, the Princess of France (Emily Eskell) and her ladies-in-waiting Rosaline (Sabryna Te’o), Maria (Lara Schwerdt) and Katherine (Madeleine Jones) arrive and test their resolve. A second plot involves a Spanish nobleman, Don Adriano de Armado (Berynn Schwerdt) who is bent on wooing a comely country maid called Jaquenetta (Claire Lovering). A bumpkin called Costard (George Banders) is also sweet on Jaquenette but is no match for the Don and finds himself being used at the go-between for one and all. The women in the play are highly spirited and independent, and while attracted to the men refuse to become their playthings. As a way to increase the number of roles for women, Ryan has Longaville played by a woman in masculine attire (Scawthorn) who holds her own in the privileged men’s world. By doing so, Ryan introduces the issue of marriage equality. The device works brilliantly, without feeling at all gimmicky. When the young people eventually pair off, there just happens to be one lesbian couple. While using Elizabethan costuming, Ryan also injects a great deal of fun by portraying the officious, bureaucratic Anthony Dull (Scott Sheridan) as a contemporary park ranger. Speaking of costuming, Melanie Liertz has done an exceptional job on the smell of an oily rag. Apparently the women’s gowns are made from painted canvas. Amazing. Ryan’s cast is terrific. Some handle the language better than others, but overall it’s performed with a zest that fills the air, sailing effortlessly to the top of the hill. Beryn Schwerdt is hilarious as Don Adriano, flouncing around in melodramatic fashion with a fruity, comedic Spanish accent to match. Aaron Tsindos is also funny as the Don’s manservant Moth. Scawthorn is impressive as Longaville, Lembke-Hogan exudes confident poise as Navarre and Walter is dashing as the serious, cynical Biron. But all the cast – which also includes Wendy Strehlow and James Lugton – are on song. A fun night. The evening begins with a short curtain raiser: Josh Lawson’s Shakespearealism, a clever, 30-minute send-up about Ralph Shakespeare, a young playwright who pioneered realism on stage but lived forever in the shadow of his brother William. Directed by Lizzie Schebesta, with Lembke-Hogan as Ralph, James Lugton as jaded theatre manager Philip Henslowe, and Scawhtorn and Tsindos as two actors, it’s a cute piece but makes for a long night. Oscar Wilde’s The Importance of Being Earnest is one of the greatest comedies of all time, but I’m not sure that the play with its witty repartee and drawing room settings lends itself to an outdoor production in the same way that Shakespeare does. Damien Ryan directs an enjoyable enough production but it often feels a bit try-hard in the comedy stakes. The slapstick routine of Algernon (Aaron Tsindos) and his manservant Lane (James Lugton) falling off the stage doesn’t sit right in Wilde’s stylish world, nor does Cecily (Eloise Winestock) gagging on the name Algernon. What’s more, I didn’t find any of that particularly funny. Some of the gags work well – the running joke about the servant’s bell is amusing – but the portrayals of the gun-toting Cecily and hyper Gwendolen (Claire Lovering) feel far too overplayed. Deborah Kennedy has the style absolutely right as Lady Bracknell and nails every laugh, delivering the famous lines as if they’ve never been said before in a standout performance. Wendy Strehlow is also on the money with Miss Prism, while Tsindos has the measure of the witty, devil-may-care Algernon. Independent company Sport for Jove celebrates its fifth year in 2014. In that short time its outdoor Shakespeare productions have become a highlight on the Sydney theatre calendar. 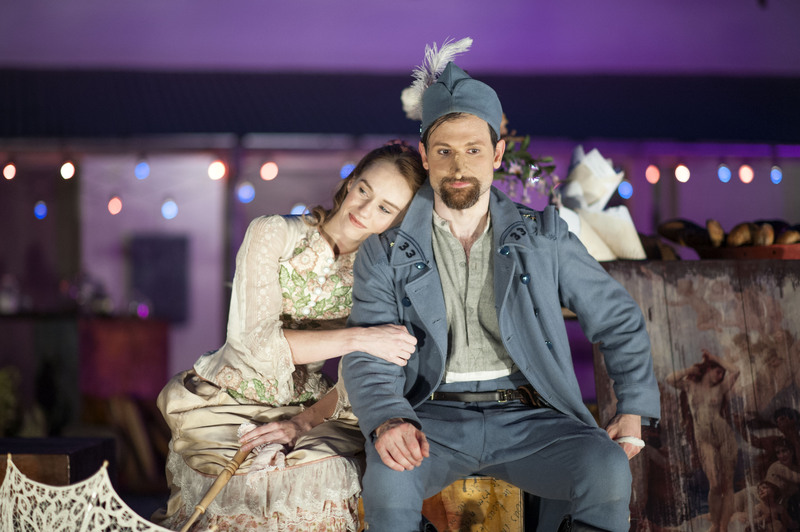 This season alongside Much Ado About Nothing, the company presents a marvellous production of Edmond Rostand’s 1897 French masterpiece Cyrano de Bergerac: an epic five-act romantic comedy full of poetry, passion and humanity. One of the great love stories, it tells of maverick soldier-poet Cyrano de Bergerac, an uncompromising man full of passion and wit, who runs rings around everyone verbally and is equally adept with a sword. He falls in love with the beautiful, intellectual Roxane who would have been his were it not for his enormous nose. Instead, he helps Christian – who is handsome but no Einstein – to woo Roxanne with passionate letters. Only on Cyrano’s deathbed does Roxane discover that he has been the love of her life. 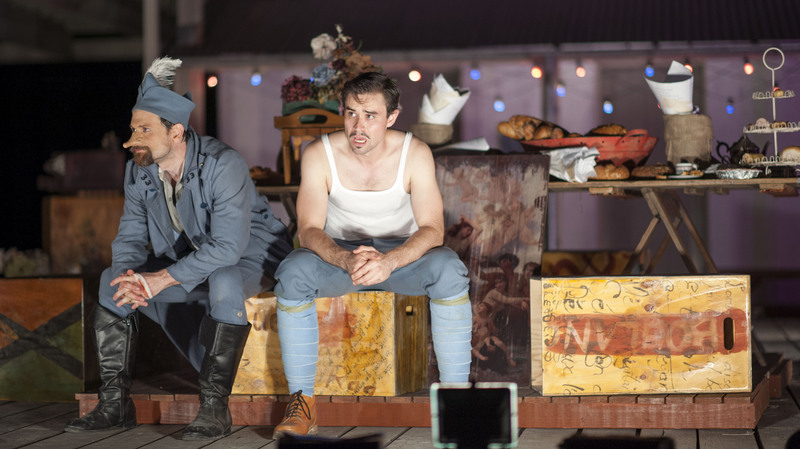 Sport for Jove’s artistic director Damien Ryan has written a vibrant adaptation using verse and prose, which is faithful to Rostand’s original but moves the action from 1640s Paris to the Belle Epoque and the start of World War I. With a keen sense of how to use the outdoor space, Ryan directs a production that is playful and full of verve yet ultimately extremely moving. Barry French’s set makes the most of the lovely surrounds at Bella Vista Farm, using the homestead balcony for the famous wooing scene (Rostand’s nod to Romeo and Juliet) and a shed for the war scenes, which are greatly enhanced by David Stalley’s sound design. The aptly named French also has fun suggesting the French setting with baguettes to the fore in the boulangerie, while Anna Gardiner’s costumes are a delight. Yalin Ozucelik is outstanding as the swash-buckling Cyrano, capturing his cockiness, volubility and wit as well as his aching heart and self-loathing. At times he is like a verbal tornado. Lizzie Schebesta is a lovely, feisty Roxanne and Scott Sheridan is very funny as Christian – though the scene when he snaps, wanting Roxane to love him for himself rather than the words that Cyrano puts into his mouth is very touching. The rest of the 16-strong ensemble, who between them play around 50 characters, are uniformly strong. The production runs three hours but it’s so engaging the time flies. There are few better ways to spend a night under the stars so pack a picnic and treat yourself to one of the best nights of theatre on offer right now.